While most of his illustrious stablemates have been on their summer breaks for some weeks already, Willie Mullins’ very classy staying hurdler, Thousand Stars, has been making hay while the ‘rain falls’. He recorded his second Auteuil victory in less than a month, and a second successive French Champion Hurdle, on Sunday, when outpointing local favourite, Nikita Du Berlais, to land the coveted Grade 1 title, once again, writes Elliot Slater. 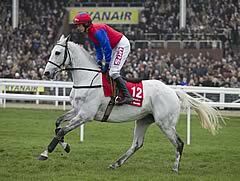 Fourth to Big Buck’s in the Ladbrokes World Hurdle at the Cheltenham Festival, in March, the grey then ran a stormer, when failing by just a neck to beat the smart Oscar Whisky at Liverpool in the Grade 1 Aintree Hurdle, before finishing third back at two miles in the Rabobank Champion Hurdle behind his star stable companion Hurricane Fly. With Mullins seeing that the gelded son of Grey Risk was holding his form well, he travelled to Auteuil in mid-May and duly obliged in beating another Mullins-trained runner, Zaidpour, in a two-and-three-quarter-mile Grade 2 affair, an ideal trial for his repeat assault on the French Champion Hurdle. Despite coming into the race having scored in the contest, 12 months earlier, French punters made their local hope, Nikita du Berlais, favourite, ahead of Mullins’ charge. However, Mullins’ horse remained popular with fans who enjoy betting on racing on Bet Victor. After being produced to challenge at the last, it was the Irish raider who showed the greater resilience and better turn of foot at the end of a truly run contest to pocket the glory once again, as well as the not inconsiderable first prize of £138,750. Winning jockey, Ruby Walsh was quick to praise his mount, who he pointed out proved his stamina in the very easy ground, having won last year’s race after the event was run at a dawdle for the first two miles. Off an end-to-end gallop, this time around, Thousand Stars shone again, and is now three from four at Auteuil, France’s premier jumps track. Get great odds on racing on www.betvictor.com.